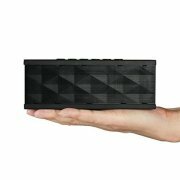 • Your versatile and reliable “go to” compact portable speaker – streams music wirelessly via bluetooth or via 3.5mm audio wire. • Premium 2 x 40mm speaker drivers for 6W+6W output with rich bass and crystal clear quality. • Fashionable and stylish design with solid performance and universal compatibility for Android, iPhone, iPad, tablets, smartphones, iPods, MP3, MP4, radio players, and other Bluetooth enabled digital players or media devices with 3.5mm aux port.